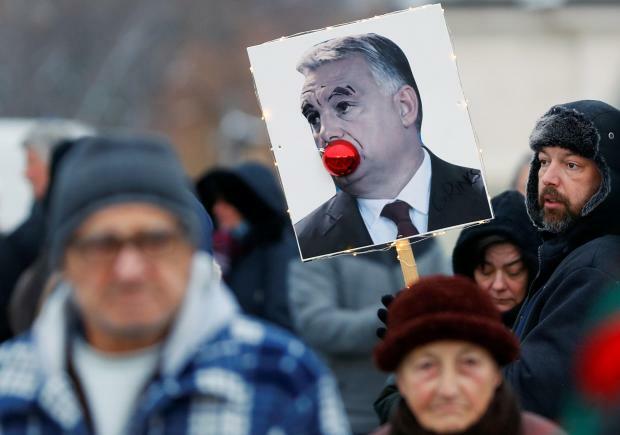 Sunday's protest, called "Merry Xmas Mr. Prime Minister" by organisers, was the fourth demonstration in a week by leftist opposition parties, student groups and civilians against Orban's government. 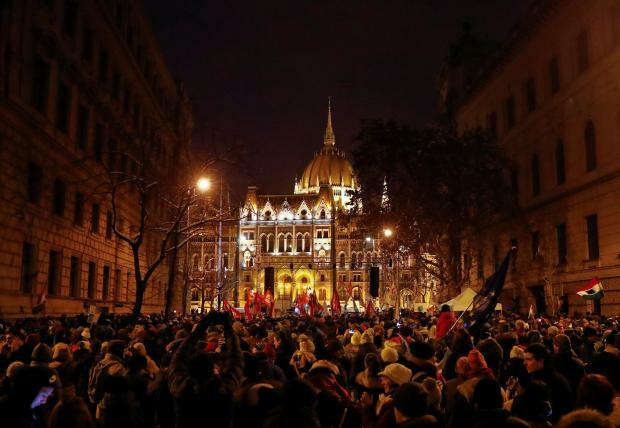 Protesters waved Hungarian and European Union flags as they walked from the historic Heroes' Square towards parliament in crispy winter cold, holding up banners with slogans including "Don't steal" and "Independent courts!". "Discontent is growing," said Andi, 26, a sociology student who did not want to give her full name. "They have passed two laws this week which ... won't serve Hungarian people's interest." The new labour law allows employers to ask for up to 400 hours of overtime work per year, leading critics to label it the "slave law". "This government ignores us, workers," Tamas Szekely, deputy head of the Hungarian Trade Unions' Association said in a speech. "We must raise our voice and give an answer." Orban has often clashed with Brussels as he has built a system that his critics see as autocratic, boosting his control over the courts and the media. Civil rights watchdogs said the new courts law was the latest erosion of democratic institutions under Orban, who rose to power in 2010. Orban was reelected in April on the back of a fiercely anti-immigration campaign, facing a weak and fragmented opposition. Earlier this month, his government forced a private graduate school, the Central European University, to leave Hungary, as part of Orban's years-long fight with liberal Hungarian-born U.S. billionaire George Soros. Fidesz said on Saturday, in reaction to the protests, that it was "increasingly obvious that criminals have been part of the street riots organised by the Soros-network."